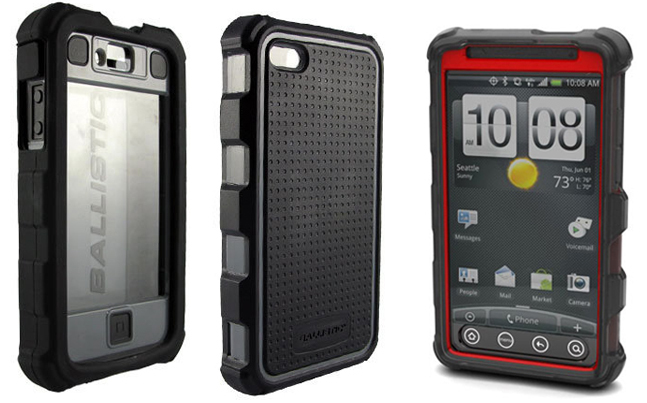 Ballistic has introduced what might be the most rugged protection you can buy for your iPhone 4 and HTC Evo. Looks like Otterbox now has some new competing rugged cases for mobile devices. The Ballistic HC case for both the iPhone 4 and HTC Evo feature a four layer protection that include inner rubber protection on a hard polycarbonate shell with outer shock absorbing rubber, and to top it all off a nice thick outer removable silicone layer with integrated post covers. So if you're looking for what might be the ultimate drop protection for your iPhone 4 or HTC Evo, this just might be the case for you. Of course with all this rugged protection, it will bring much bulk. If you need some proof of how this all works, check out the demo vid below.